The Cultural Heritage of Iraq and Syria: "Destroyed by human ignorance − rebuilt by human hope"
On Friday, 27 February 2015, the United Nations Security Council condemned "the deliberate destruction of irreplaceable religious and cultural artifacts housed in the Mosul Museum and burning of thousands of books and rare manuscripts from the Mosul Library" and having burned a few days earlier thousands of books from the Mosul, Iraq, University Library. The Mosul Museum which was not yet open to the public had a large number of statues from the pre-Islamic Mesopotanian civilizations as well as statues from the Greek Hellenistic period. 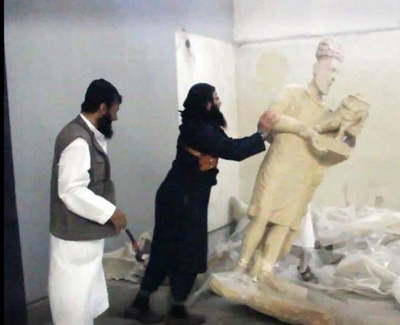 The spokesman for the Islamic State (ISIS) faction which carried out the destruction − filmed and posted on the internet by them − maintained that the statues represented gods which had been worshiped while only the true god should receive worship. This approach to pre-Islamic faiths and their material culture is the same as had led to the destruction of the large Buddha statues in Afghanistan − monuments that attested to the rich culture along the Silk Road. As if to drive home to the least philosophical in the area, the ISIS also attacked Assyrian Christian villages in the area; villages were emptied, persons taken as hostages and younger women forced into slavery. The Assyrian Christians are among the oldest of the Christian communities; some speak Aramaic, the language spoken at the time of Jesus. There are world laws against slavery going back to the abolitionist movements of the 1800s and made universal by conventions of the League of Nations and the United Nations. These conventions are rarely cited except in discussions of the current trafficking of persons as a "modern form of slavery". Now the ISIS has given us examples of slavery in its old forms, nearly to the point of caricature. We need to dust off these conventions and see that they are applied. Syria and Iraq are home to some of the world's first cities, a complex and unique meeting of states, empires and faiths.The protection of works of art and cultural heritage is a newer aspect of world law in which UNESCO is playing a leading role. Until the filming and posting of the destruction in Mosul, the looting of museums in Apamea, Aleppo and Raqqa as well as numerous archaeological sites had been known to specialists but had not gained wide public attention. Most of the looted objects were not destroyed but sold on a parallel international art market to fill the ISIS coffers. There is a need to develop global awareness and to campaign against this illicit trade in looted Syrian and Iraqi artifacts which first pass through the neighboring countries of Lebanon, Turkey and Jordan before ending in the hands of dealers and small auction houses who also profit from the theft. The protection of cultural heritage owes much to the vision and energy of the Russian artist Nicholas Roerich (1874-1947). Roerich's desire to make known the artistic achievements of the past trough archaeology, coupled with the need to preserve the landmarks of the past from destruction, led to his work for the Banner of Peace to preserve art and architecture in time of war. Roerich had seen the destruction brought by the First World War and the civil war which followed the 1917 Russian Revolution. He worked with French international lawyers to draft a treaty by which museums, churches and buildings of value would be preserved in time of war through the use of a symbol − three red circles representing past, present and future − a practice inspired by the red cross to protect medical personnel in times of conflict. Roerich mobilized artists and intellectuals in the 1920s for the establishment of this Banner of Peace. Henry A. Wallace, the US Secretary of Agriculture and later Vice-President, was an admirer of Roerich and helped to have an official treaty introducing the Banner of Peace − the Roerich Peace Pact − signed at the White House on 15 April 1935 by 21 States in a Pan-American Union ceremony. At the signing, Henry Wallace on behalf of the USA said "At no time has such an ideal been more needed. It is high time for the idealists who make the reality of tomorrow, to rally around such a symbol of international cultural unity. It is time that we appeal to that appreciation of beauty, science, education which runs across all national boundaries to strengthen all that we hold dear in our particular governments and customs. Its acceptance signifies the approach of a time when those who truly love their own nation will appreciate in addition the unique contribution of other nations and also do reverence to that common spiritual enterprise which draws together in one fellowship all artists, scientists, educators and truly religious of whatever faith." As Nicholas Roerich said in a presentation of his Pact "The world is striving toward peace in many ways and everyone realizes in his heart that this constructive work is a true prophesy of the New Era. We deplore the loss of the libraries of Louvain and Oviedo and the irreplaceable beauty of the Cathedral of Rheins. We remember the beautiful treasures of private collections which were lost during world calamities. But we do not want to inscribe on these deeds any words of hatred. Let us simply say: Destroyed by human ignorance − rebuilt by human hope." After the Second World War, UNESCO has continued these efforts, and there have been additional conventions on the protection of cultural and educational bodies in times of conflict, in particular the Hague Convention of May 1954, though no universal symbol as proposed by Nicholas Roerich has been developed. As too often, governments and people react after events rather than affirm from a deeper level of consciousness. Now, we have seen mindless but deliberate destruction of both art and people. Let us not inscribe on these deeds any words of hatred, but let us work unitedly and creatively to establish a just peace.